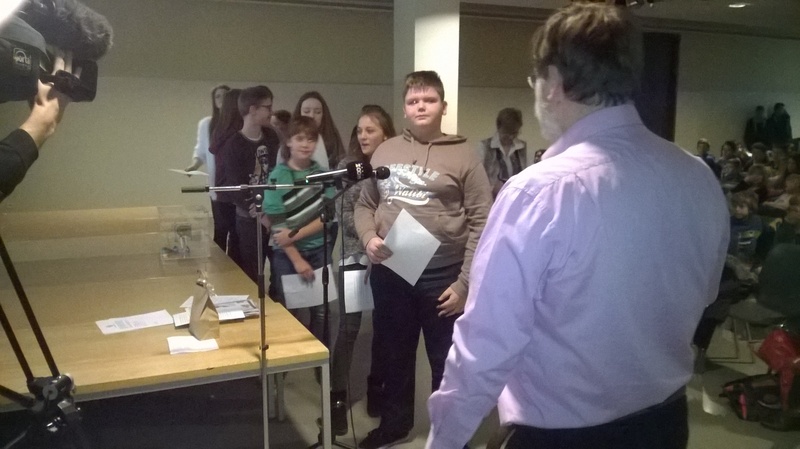 The ARISS contact Thursday January 12, 2017 at 13:47 UTC of Thomas Pesquet with 3 schools in Belgium was a success. The amateur radio contact was a telebridge connection with NA1SS via K6DUE (Maryland, USA). The selected students were at two sites (Saint-Guibert College in Gembloux and ESC in Transinne). They put their questions in turn to Thomas Pesquet KG5FYG who flew 412 km above the earth in the ISS, there was plenty of time to answer all 20 questions. Thomas received a heartfelt applause at the end of the contact. Stefan ON6TI place the students in a line for their rotation in the ARISS contact (Gembloux).